One of the presents I’m planning on giving uses fabric that likes to fray. I was reading a book called Couture Sewing Techniques, which talks about how to uses sewing techniques that are used in couture sewing and I wanted to try out some of the hand stitches it explains how to do. I thought this fabric would be the perfect way to practice these stitches. 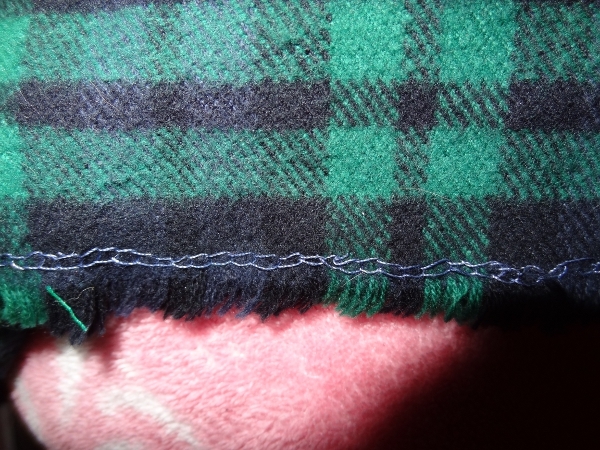 The first stitch I used is called a blanket stitch. After a while of practicing this stitch, I began to like doing this stitch. Even though I liked doing the stitch, my hands started to cramp after a while and I needed a table to rest my arms and the fabric on while I sewed. Otherwise my wrists would hurt. As for how the stitch worked on the fraying fabric, it worked wonderfully! It immediately stopped the fabric from fraying without using chemicals, glue, or a serger. Because of the hand cramps and my wrists hurting after using this stitch, I don’t plan on using it on anything but something very fancy and meaningful to me. Here’s what the stitch looks like on the fabric…. The second stitch is called a thread stitch. This one… just drove me crazy. I did it wrong but I didn’t know I was doing it wrong until I gave up on it and re-read the instructions again. I think the reason why I did it wrong is because I was tired and wasn’t thinking right. I do plan on trying this stitch again in the future, but not for a while. I’m still a little frazzled and hesitant about attempting this stitch so I need some time to re-read and figure out how the stitch is supposed be done. I have another present I’m working on right now, but I’m not sure if I’ll give it to the intended owner or I’ll end up keeping it because I’ll like the final product too much. I plan on using red taffeta with black velvet designs on it along with rust/black taffeta to make the present. Right now I’m deciding on which red fabric I plan on using for the present. Here is the fabric I’m deciding on using. They have different black velvet designs on them and I don’t think I’ll make a final decision until I cut out the pattern and lay it on the fabric to see how the design will look. That’s all the presents I can talk about right now. Once I’m all done with them and decide to give them away, I’ll post pictures of the finished products.